7am - Yesterday I was describing to you how I was going about sealing the Tiny Waterfall. 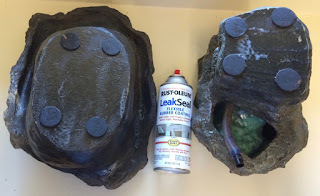 After I had coated the inside of the pool and the fall, I found in the Rust-Oleum website a Technical Data Sheet on the LeakSeal product that I was using. Can LeakSeal® be applied in areas that will be immersed in water? No, LeakSeal® is not intended for use in areas that will experience constant contact or submersion in water. Darn! Have I messed up the Tiny Waterfall? I found the Rust-Oleum tech support on a Google search, and phoned them. 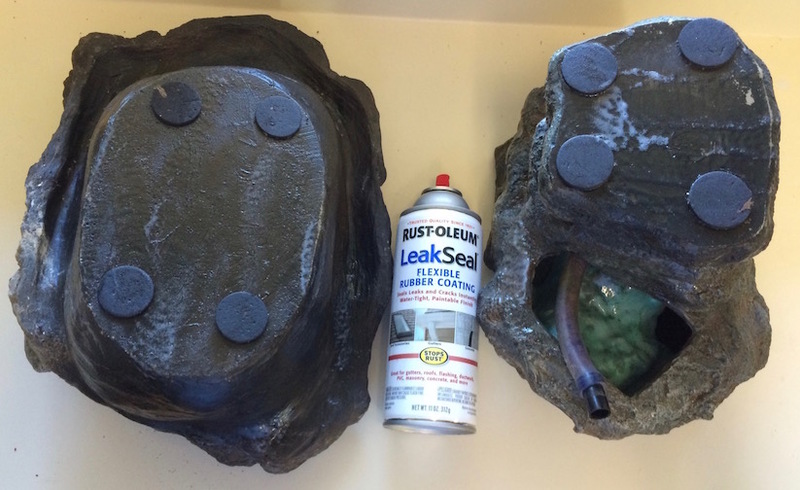 I described how I had applied LeakSeal to a tiny waterfall made of fiberglass. And then I asked what would happen if the LeakSeal was applied in an area always in contact with water. The tech told me, "The LeakSeal would eventually peal off." Then she advised, "Are you able to apply LeakSeal to the outside of the waterfall?" And that is exactly what I am doing now! "Yippee!!" I've had Bonsai trees before. But, I never understood Bonsai back then. Now, with my life passing in slow motion, I have the time to look at my two Bonsai and consider them. What do my Bonsai want? My Bonsai answers this question. But only if I look at one of them for a very long time. 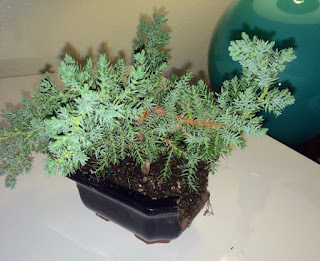 My small Bonsai is only 5" tall. From the bottom of its trunk to the tip of its uppermost branch. Last week, I bumped the small Bonsai, and it fell. I bumped it as a result of my balance issues. I fell against the garden bench where the small Bonsai was sitting, and down it went! That fall doomed Small Bonsai's China dish! "I think that you should repot me using that old Bonsai dish over there." And Small Bonsai pointed a branch at the old Bonsai dish! So, this morning I am preparing to transplant Small Bonsai into a new, and slightly larger home! Do you see the broken edge of Small Bonsai's dish? I grew up in a machine shop environment. My Dad owned a machine shop. I started work there when I was 9-years old, in 1946. My Dad's shop went busted in 1953 when I was 15-years old. And that was the end of that job. My Uncle Seymour owned a machine shop which was founded in 1953. My Uncle Seymour and his partner started their shop inside my Dad's shop [Before my Dad went bust.] They paid my Dad rental time @ $1/hour, for each of them. Of course, I hung around Uncle Seymour and his partner, Del. They were both miraculous people in my eyes. They built tool, dies, jigs and fixtures! That's what I wanted to do. I would sweep the shop and clean the machine tools for free, just so that I could talk to these two guys. You may be wondering why I titled this post, "Marios de la Mesa?" I'm getting to that. Just taking a route thru my history to get there. When I got married in 1963, I was working for the Post Office, in Los Angeles. My wages were not great. $4,800/year. My Wife wanted kids, so did I. You really could not afford a family on $4,800/year. Not in 1963, anyway. I approached Uncle Seymour at a party at my Grandfather's home. Seymour told me, "Talk to Del." So, I talked to Del, got hired into Commercial Tool and Die, and quit the Post Office. I was in the machine shop apprentice program at Commercial. But I never got to be a journeyman machinist. Because one day, about 6-months after I began at Commercial, Uncle Seymour walked out into the shop and told me, "I want to talk to you in the office". Seymour informed me, "I need help in the office. I want you to work in the office 4-hours a day. Then finish your day in the shop." What actually happened though, is that the day I went to work in the office was the last day I ever worked in the shop! The company was growing like crazy. I filled all the shoes of that company. I was the purchasing agent. The shipping clerk. I received everything that the company bought. I did job costing. Produced operation sheets for machine shop jobs that the company took on. Commercial got a production job to manufacture baby seats. I setup the assembly line for the baby seats. OK, we are finally, at long last, back to Mario's de la Mesa. Mario's prices their soft drinks, iced tea @ $2.95. Why does Mario's charge $2.95? Why not $3.95? How about $5 bucks flat? Now I was brought up in a Job Shop environment. Everything in a Job Shop came down to knowing how much it cost to make something. Once you knew the cost, you had a good idea of what you could charge. So, I get a big kick out of Mario's charging $2.95 for maybe 20-cents of Pepsi. Make your profit where you can. Giant Costco makes most of their $$ on the memberships. Some things they even sell at a loss. If you put all your flower pots in flat pans, no water would leak onto the concrete. In economics classes in college, they teach that the most profit is made, when an item is sold at a price where the most customers will buy it. BTW, I would buy Pepsi at $1.95. At $2.95 I drink free ice water. Come to think about it. Why doesn't Mario's charge $2.95 for an ice water? Your "flat pan" idea is interesting! I really don't like a "flavor" with my meal, so I always order ice water, even in restaurants that serve free drinks for seniors. I think Suz has a great idea. You can get long and skinny plastic flat pans at Lowes or any garden center. They are used to hold the little pots you start seedlings in. The story you told is true in any retail business. Example, the wholesale cost of clothing is the same today as it was when my mother worked in a garment factory in the late forties-early fifties. That's why I almost never buy clothing that isn't on the sale rack. I discovered this when I worked receiving for a major western wear outlet back in the 80's. Jeans were retailing, in the store, for $40.00 a pair but they were paying $2.45 a pair for them. I was talking about it at the folk's one day and that's when I found out what the garment factory was getting for pants in Mom's day. I'm really like the upgrades you are doing for your garden on your balcony. Having been the owner of a menswear store in the 70's, I, as most stores did and do, operated on the keystone system. Double the price. If I paid $10 I would double to $20 and then add a few dollars to cover shipping. So the jeans would sell for $23.95. Of course then would come the day when I might have to put them on sale. Huge profit decrease or break even or loss. Had to be a smart buyer!